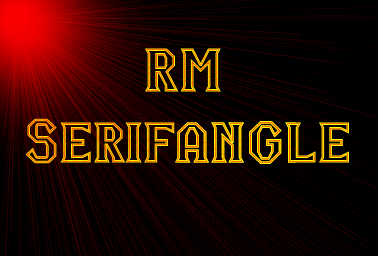 See also RM Serifangle 3D by p2pnut, RM Serifangle medium by p2pnut. I started off playing with angles ... and this developed. Info: Created on 16th December 2009 . Last edited on 8th January 2010. Really nice. The angles almost give it a beveled look. The 4 and 5 seem a little off to me. @linehand: The 4 has been a bit of a problem - managed to give it one brick more width. Ummm, I quite like the 5 myself. @Frodo7: I not only agree with you about the optical adjustment ... I had altered the Ss last night to see the difference. Have now made appropriate alterations to all other rounded glyphs and numbers. Congratulations! FontStruct Staff have deemed your FontStruction worthy of special mention. “RM Serifangle” is now a Top Pick. very classic looking. my only suggestion would be to experiment with a wider space character to see if it increases readability. otherwise, another enchanting font you have given us. Happy New Year to all Fontstructors and staff. Thank you fk for pointing out the narrow spacing ... despite my usual check and check again policy this had slipped past me without notice. Nice family that you're raising here, p2pnut. There seems to be a sturdiness in all that you do. Keep playing with those angles.